Paytm Vs Most Evil Firm in the World? HomeScamPaytm Vs Most Evil Firm in the World? Facebook is the most evil firm in the world, says Paytm chief Vijay Shekhar Sharma. National Payments Corporation of India (NPCI) is the body set up by the Reserve Bank of India (RBI) to oversee payment services. Unified Payments Interface (UPI) is an instant real-time payment system developed by NPCI for facilitating inter-bank transactions. The interface is regulated by the RBI and works by instantly transferring funds between two bank accounts on a mobile platform. UPI merges several banking features and “Peer to Peer” money transfer and payment directly from bank accounts into a single app. Each participating bank provides its own UPI App for Android, Windows and iOS mobile platform. Major UPI players in the Indian market are Tez(Google), PhonePe(Flipkart) and BHIM (NPCI), with Tez being the largest by far. WhatsApp, the widely popular messaging platform bought by internet giant Facebook in 2014, has its largest market of over 230 million active users in India. It is in the process of testing and limited deployment of its in-chat payment platform modelled on UPI, WhatsApp Pay. Neeraj Arora, WhatsApp's global business head, resigned from the board of directors of Paytms parent One97 Communications, a position which he had held since 2015, earlier this month. 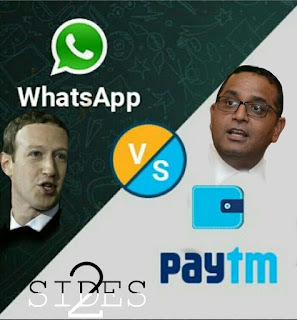 Paytm CEO Vijay Shekhar Sharma, in an explosive telephone interview with CNBC, attacked WhatsApp and its parent company Facebook, saying "Facebook isn’t just an evil company, it’s the most evil company in the world,”. He had on the previous day tweeted that WhatsApp was misusing the UPI interface. Linking to an article in The Ken, Mr Sharma tweeted how WhatsApp Pay, the messenger giant’s upcoming payments platform, will kill the “open UPI system with its custom close garden implementation”. He also accused Facebook CEO Mark Zuckerberg of playing cheap business tactics to get an upper hand. Mr Sharma argues that WhatsApp Pay flouts several UPI norms. As opposed to other existing UPI apps, WhatsApp doesn’t require a username and password to open the app. This would be a major "security bomb" as it would become a risk for its users who use it to make payments by linking it with their bank accounts. Mr Sharma also alleges that WhatsApp Pay doesn’t support interoperability — the apps iOS version currently cannot send money to non-WhatsApp users, and its Android app, though has the option, it is not immediate to spot. In a tweet, Sharma had said, "After failing to win the war against India's open internet with cheap tricks of free basics, Facebook is again in play. Killing beautiful open UPI system with its custom close garden implementation." Further, the app also doesn’t have the capability to scan QR codes or send money requests, which are requirements for other UPI apps. Reports suggest that the BHIM-UPI branding is also not being used anywhere within the app. By overlooking these features as specified by NCPI, WhatsApp Pay will be able to provide a more seamless, albeit unsafe, interface for its users, thus giving it an unfair advantage over the current market. Mr Sharma goes on to allege that NPCI has sided with WhatsApp by allowing it to launch the app in its current form flouting the norms. Paytm reportedly had to wait 3 months until its app conformed to all UPI requirements, but WhatsApp has been given preferential treatment, allowing it to launch an app that was easy to use but didn’t adhere to all the UPI rules. Three-factor authentication - a must have for all banking transactions online thus far - was removed by an NPCI circular right before WhatsApp Pay's launch without the feature of additional username and password. The Paytm CEO alleges corruption within the NPCI and says Facebook "arm-twisted" UPI to facilitate this relaxation in norms. Many fellow Indian entrepreneurs have attacked Paytm and its CEO for his comments, probably trying to pull down their biggest Indian rival in the financial technology market. Mr Sharma, however, did find support, like from Flipkart founder Sachin Bansal who retweeted his tweet in which he’d said that foreign companies must not be allowed to colonize India’s internet. Mr Bansal also implied in another tweet that the presence of Neeraj Aurora on the Paytm board probably already had compromised the fight between the global and Indian giants. On being called a protectionist, Mr Sharma retorted that all he wanted was level playing field where no single entity would be allowed to bend the rules to its whims and designs. Sharma said that WhatsApp was using the Embrace, Extend and Extinguish philosophy with UPI, first adhering to its norms, but then making it hard for people to send money outside the WhatsApp ecosystem, thus hurting other players. Thus, thanks to its deep pockets and preferential actions by a handful, WhatsApp Pay will monopolise the market using its unfair upper hand, while at the same time posing a huge security risk. Paytm's arch-rival MobiKwik, whose husband and wife founder duo took to Twitter to attack Mr Sharma, tweeted, “Picture a guy who shouts expletives at competition openly, calls to actively discourage prospective investors in competition, puts PM on the front page and does basically anything legal or illegal to get an advantage. Picture him now whining about an unfair playing field,” said Bipin Preet Singh. “Oh so after flouting rules to run Alibaba’s payments bank under his own name, now Paytm founder takes a dig at WhatsApp!? A bank license requires 51% Indian ownership. Pls explain how a bank is operating with majority Chinese funding and Chinese Board!,” asked his wife Upasana Taku. Mr Sharma's comments go against the very idea of an open market. The Chinese chatting and mobile payment app WeChat has been hugely successful with an adoption rate of 93% across tier I and tier II cities in the country. Paytm and WhatsApp Pay both are competitors in the same niche as they strive to emulate WeChat's success. Mr Neeraj Arora stepping down from the Paytm board is but a direct result of this conflict of interests. Regardless of which player will come out on top, market forces will ensure that ultimately the customer will benefit. WhatsApp's payment service is an existential threat to Paytm’s business. With its huge network of 200million+ users in India, Paytm does not stand a chance to win against WhatsApp on the basis of merit. This explains the Paytm CEO's shrillness and 'holier-than-thou' attitude while referring to the newcomer. FreeCharge founder Kunal Shah tweeted that firms that competed with WhatsApp Pay would have no option but to play the “Patanjali card” and label the foreign company as anti-national and corrupt, reflected in Mr Sharma's "most evil firm in the world" comment. WhatsApp Pay is still in its testing phase and the final product, expected to be launched in March or early April, will have to follow all the guidelines set by the NPCI. Finding the drawbacks and firing upon a not yet finished product merely highlights Mr Sharma's desperation to keep his firm afloat.